Pork Farms are well renounced for their delicious Pork Pies. I'm sure if your reading this you love Pork Pies too! I enjoy mine with some simple brown sauce, whilst my partner and mother enjoy with some pickle. Making this even better, Pork Farms are also offering a £1 off voucher on their Facebook Page. Pork Farm pork pies are very versatile and can be enjoyed in many way. Whether this be paired with peas, smothered in pickle, shared with friends or eaten on the run, there are many ways to enjoy. A recent survey from Pork Farms showed the following. 57% of Brits would happily serve a pork pie at a dinner party, whilst only a third would serve scallops. Almost one in ten would order a pork pie if it was on a restaurant menu. They also found the top 10 choices to accompany a pork pie. 10. 2% each - Baked Beans, Crisps, Gravy and Mushy Peas. 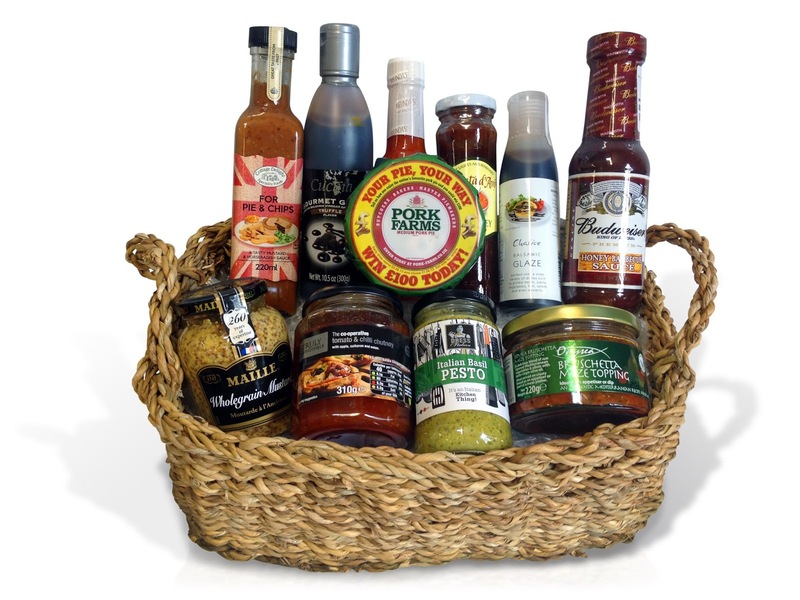 I now have the opportunity for one lucky winner to win a food hamper filled with accompaniments for your pork pies. Please note contents of the hamper may vary. With a bit of crisp salad. I live in Melton Mowbray so it's all about the pork pies here. Straight out of the packet or with a scotch egg! I love mine with a warm egg salad. warmed and dipped in salad cream! Warmed up on its own. With a big plate of salad. I like mine with coleslaw on top. I'm boring but I normally have it alone. This post has given me a few ideas to try though. With my mum's home-made red onion chutney! I love it all by its self. straight out the pack on the way home from food shopping! Just pie - cold. Not heated or with any sauce - I want to savour the flavour!! my cat eats some of it with me! Pamela says - Simply. With a salad. With a large chunk of creamy, crumbly Lancashire cheese, cherry toms, pickles and crusty bread. I like mine ploughman's style with bread, cheese and pickled onions. With brown sauce or on its own. With a bit of cranberry sauce. With homemade Beetroot and Horseradish jelly. I love mine with chutney and pickled onions! Almost any way except warmed up. I love the jelly and don't like it melted into the crust. Cut into slices, microwaved if I want it hot and sprinkled black cracked pepper all over! cold from the packet or warm with a few chips! on its own, cold cut into segments. Cold and eaten like an apple! At a picnic, in the park on a sunny day! On the go; it makes a great quick and cheap lunch on the move! I like to have mine just on their own. with smooth branston pickle sauce and a couple of cherry tomatoes!! Small pies - all in one! My husband eats his pork pie with mayonaise! As part of a picnic. With plenty of homemade Mayo!! Just a little brown sauce. with my husband--and dill pickles! Pork pies are yummy when accompanied by a light salad with salad cream or some bread and butter! Out fo the packet trying to avoid the gelatin! Places in the UK I would love to explore. Celebrate Easter by Winning 3 Little Tiger Press Books. Whats In Your HandBag? Money Supermarket Competition. © 2017 My Mummy's World . Phoebe Template designed by Georgia Lou Studios. All rights reserved.